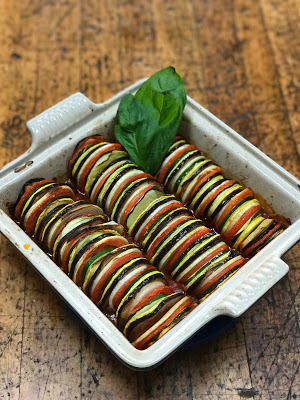 When a Disney Movie Inspires You….Ratatouille! 1. Get a large deep sauté pan or medium dutch oven and place over medium heat. Place olive oil into the pan. 2. While your olive oil is heating up; dice your onion, garlic, basil, and crush your whole tomatoes. ***TIP: When you crush your whole tomatoes remove the tomato stem. Also save the sauce from the can, because that will go into your sauté pan later. 3. Now that your oil is hot, add your onions and a pinch of salt. Sauté your onions until they are tender and slightly translucent. 4. Add your basil and garlic to the onions; cook that about 15 minutes. Continue to stir the garlic, otherwise it will burn if left alone in the pan. 5. After 15 minutes add the red pepper flake and herb de provence; cook for an additional 5 minutes. 6. Finally add your crushed tomatoes and tomato sauce to the veggie mixture. Add a heavy pinch of salt to the tomato sauce. 7. Bring everything to a boil and then reduce the heat. Simmer your red sauce for about 1 hour or reduces to half. 8. After you have reduced your sauce give it a taste. If you feel like it is too acidic, this is when you add the sugar. I almost always add a little bit of sugar to help balance out the flavors. ***TIP: I made this red sauce the night before making my actual ratatouille dish. It refrigerates great and can easily be added to pasta and meatballs for another meal. 1. Before we even start slicing our veggies lets pre heat our oven to 350 degrees. Also, grab an 8×8 (square) baking dish. Add about 1 cup of the red sauce to the bottom of the dish, or enough that the entire bottom is coated. This will give flavor to you veggies and will also keep them from sticking to the baking dish. 2. The easiest way to cut all your veggies would be a mandolin. You can knock out all the thin veggie cuts without the stress of making every cut the same. Just be mindful of your fingers when using the mandolin. If you don’t have one then making thin cuts with your knife works too, no worries. 3. When slicing my veggies I literally did one at a time and just made little piles. Once my piles we done I started to assemble. The order I used, that seemed to work pretty good, was yellow squash, zucchini, tomato, onion, and eggplant. Then you just keep repeating until you have filled an entire row in the dish. ***TIP: I would stack together about 4-5 round of this sequence in my hand and then place it in the dish. It stayed together better than just stacking it one by one in the baking dish. 4. After you have filled your dish, brush the tops of your veggies with olive oil to help them brown nicely in the oven. Place the ratatouille in the oven for 60 minutes; or until the sauce is bubbling and your veggies are golden brown and soft. 5. Finally, remove your baking dish from the oven and get ready to have a new favorite healthy dish.